In this article, we will see a basic version of progress bar. A progress bar is shown to user to indicate the progress of a task that is going to take some time to complete. Obviously one should be able to measure the percentage completed so that the progress is updated. In this example we will see how a progress bar can be launched and its progress updated. The main layout has some text and a download button. On clicking the download, progress bar should show the percentage of task progressed. How to update Progress Bar’s progress? ProgressDialog object represents progress dialog. 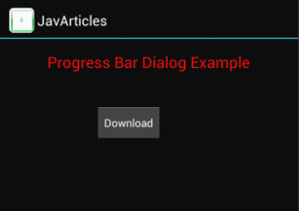 In order to display the progress bar, all you need to do is to create an instance of ProgerssDialog and call show(). Now let’s set some title. Instead of activity circle indicator, we will set the display to horizontal styled bar as our goal is to show the progress. When a process is created for your application, its main thread is dedicated to manage the top-level application objects and any windows they create. If you want to update a progress bar’s progress percentage, you can create your own threads, and communicate back with the main application thread through a Handler object by calling handler.post(Runnable) in your new thread. 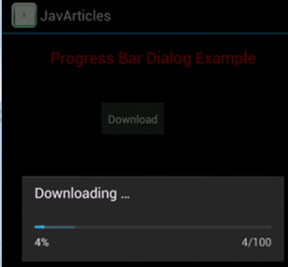 The progress of a progress bar is set using setProgress, the value passed is an integer. The percentage of progress is measured based on the maximum value set, for example, setMax(100). The progress is updated using Handler object. This was an article about Android Progress Dialog Example.